The mission of Our Town Theatre is to stimulate the intellectual, cultural, artistic, and social growth of our community by promoting every aspect of the performing arts. Jane B. Avery, our founder, taught elementary grades through high school in Garrett County. She staged plays at Southern High School and Garrett College, as part of Garrett Lakes Arts Festival, as well as collaborations with Nancy Learey, founder of the Garrett Choral Society. 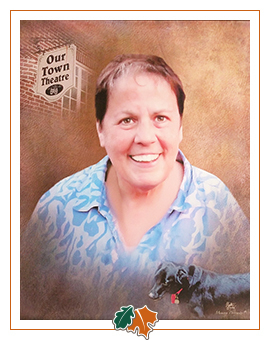 In 1994 Jane B. Avery toured the United States with her beloved Max the Wonder Dog and formed her ideas for community theatre in Garrett County. Upon return she shared her ideas with theatre friends who believed in Jane’s dreams and offered their support. A theatre should be a cornerstone of its society. Our Town Theatre will provide a variety of plays and other theatrical experiences to encourage the growth of knowledge and positive action in our community. We strive to open the mind, inspire the imagination, animate the senses, nourish the spirit, and propagate humor. We will nurture respect and compassion for others and foster awareness, perseverance, and hope. We will provide a medium for the artistic development of theatrical artists and writers of all ages. By maintaining high artistic standards and interrelating with our citizens, we will endeavor to meet the needs of our community. With the assistance of Garrett County Arts Council, the Board established a nonprofit corporation. Jane’s Theatre II students’ production of Keepsakes in May 1997 was the first performance in this theatre. Keepsakes was a research project Jane’s students would develop into a monologue and perform. The person each student selected had to have lived in Garrett County, been deceased for 40 years, and have contributed to the story of Garrett County. Through the years there were several Keepsakes productions here. Students from the second Keepsakes production wrote a poem with Jane that is a heartfelt tribute to growing up in Garrett County. The first week in June 1998, actor Stephen Lang presented his world premiere of poetry recitations called “Lang, Alone,” and that weekend The Dining Room opened; the first full stage production in the newly renovated OTT. For 20 years, OTT has enriched the community with a variety of theatrical opportunities, including plays, concerts, open mic nights, workshops, children’s camps, teen activities and outreach programs. Collaborations with other community organizations, like Garrett County Board of Education, Ruth Enlow Library, Garrett County Health Department, and The Dove Center have creatively conveyed their messages and solutions to local social issues. Our Town Theatre has also endeavored to enrich the community through original productions about its rich and storied past; some in collaborations with the Towns of Oakland and Kitzmiller, The Republican Newspaper, Garrett College, Frostburg State University and Garrett County Historical Society. Upon the passing of Jane B. Avery on September 8, 2016, the community and OTT Board recommitted to continue this shared legacy. OTT was named “Best Community Theatre in Western Maryland” in Maryland Theatre Guide’s Best of 2016. OTT's ambitious 20th Anniversary season of 2017-2018 culminated in a reprise of The Dining Room, directed by Jane’s handpicked successor, Mikey Virts, June 6-10, 2018. Built in 1935 as the Parish Hall for St. Matthew’s Episcopal Church, the congregation chose not to build the church that had been designed. This building was used for worship services while arrangements were eventually made in 1939 to use the Garrett Memorial Church, formerly Presbyterian, where St. Matthew’s Episcopal Church is now located. It was then used by the Maryland National Guard during World War II, and from 1949 to 1954 it was called the “National Guard Armory,” until a new building was constructed near the Courthouse for that purpose. During the early 1960s it was used by St. Matthew’s Episcopal Church again, for Sunday School, while the church down the street was being renovated. In 1964 this building became the museum and headquarters of the Garrett County Historical Society (GCHS). By 1996 a larger space was found for GCHS in the Professional Building down the street. OTT is a “black box” theatre that has had many arrangements for audience seating. The lighting and sound booth are in the loft upstairs. An ADA-accessible ramp outdoors leads to the main floor, which has an ADA-approved bathroom in the back. Our Town Theatre gets much-needed funding from the Garrett County Arts Council and the Maryland State Arts Council. Each year, the grant writers on the Board of Directors submit a request for funding. We are fortunate that both organizations see our mission and our works in the community as valid and reward us with funding.